The Bayfront St. Petersburg EB-5 Project is an equity style investment where EB-5 investors will invest in the construction and development of a 35-story luxury condominium tower in downtown St. Petersburg, Florida. The project will begin construction in 2019 and will offer direct, unobstructed ocean and downtown views. 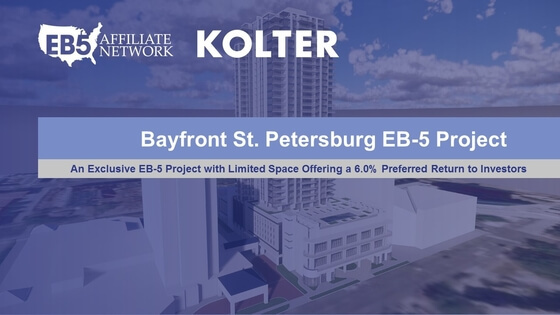 The Bayfront St. Petersburg project is the 10th EB-5 project by EB5AN and the Kolter Group. Bayfront St. Petersburg involves the development of a new mixed-use real estate project consisting of condominiums, retail space, and other amenities in a 35-story tower. The Project contains luxury condominium units with approximately 400,000 square feet of sellable residential space and approximately 10,000 square feet of sellable retail space. Bayfront St. Petersburg is situated in the midst of downtown St. Petersburg’s world-class lifestyle amenities, including high-end dining and nightlife, and highly rated waterfront park system. The Bayfront project was launched due to the overwhelming success of ONE St. Petersburg, another recent condominium project that is 100% sold out and located just 3 blocks away from the Bayfront project in downtown St. Petersburg. One of the largest private developers in the United States, The Kolter Group LLC, together with its predecessors and affiliates, has invested in real estate projects totaling over $15 billion in value (both realized and in-process). The company is headquartered in south Florida with four (4) divisions – Homes, Urban, Hospitality, and Land – and has developed thousands of single-family homes, condominium units, hotel rooms, and finished land lots in Florida. The company has borrowed hundreds of millions of dollars over its 20+ year history and has never defaulted on a single loan. Winlo Management Group, LLC (WMG) is a full-service investment banking and financial services broker-dealer. The firm’s leadership has institutional experience across investment banking, corporate diligence, private placements, securities offerings, and capital markets. With respect to EB-5, Winlo’s focus is on sourcing quality projects from reputable partners and helping investors navigate the challenging marketplace and investment process. Since 2004, Dr. Paul Sommers has been a professor at the Institute of Public Service and at the Albers School of Business, Seattle University. His expertise focuses on regional development, regional economics, and workforce forecasting. Dr. Sommers currently serves on the board of the Pacific Northwest Regional Economics Conference. He holds a PhD in Economics from Yale University. EB5 Affiliate Network is a national EB-5 consulting and investment firm with of a unique team from a diverse set of institutional backgrounds including business strategy, private equity, capital markets, and real estate as well as securities, tax, and immigration law. The firm’s diverse backgrounds give it an advantage in identifying and structuring EB-5 deals from a professional finance perspective with established developers in the United States who are interested in creating economically feasible and financially sound EB-5 projects. Established in 2001, Signature Bank is a full-service commercial bank in New York City. Its total assets exceed $26 billion. Signature Bank’s clients consist mostly of private entities, each with a net worth of at least $20 million. It is traded in the U.S. stock market on NASDAQ with the trade symbol SBNY. Signature Bank was voted by Forbes Magazine in 2014 as the #1 publicly traded bank in the U.S.
Marcum LLP is one of the largest independent public accounting and advisory services firms in the United States, with offices throughout the U.S., Grand Cayman, and China. They offer an extensive range of professional services and a high degree of specialization. Marcum is a founding member of the Leading Edge Alliance (LEA). As the second-largest international professional association, LEA Global can open doors in the more than 106 countries where its 220 member firms operate. KAST Construction was designed and built by top executives from the nation’s largest and most prestigious construction firms. These industry leaders share a passion for continuous improvement, professionalism, and attention to detail. Based in West Palm Beach, Florida, KAST has expertise in varied industries from healthcare and hospitality to commercial and multifamily residential development. Private placements, including those offered through the EB-5 Immigrant Investor Program, are subject to U.S. securities laws and regulations. Private placements and EB-5 offerings have extensive risks and are speculative in nature. Therefore, it is important that anyone considering participating in a private placement or EB-5 offering understand the risks associated with such offerings. Nothing contained in this website should be considered an offer to sell securities. The information contained herein is for informational purposes only. Only a formal, privately distributed offering memorandum and appropriate securities documents, fully executed by an accredited investor, will represent a sale of investment. Below are several financial risk factors that are common among private placements and EB-5 offerings. This list is not comprehensive and official offering documents should be reviewed with an appropriate professional prior to making any investment decisions. 1 One of the largest private developers in the United States, The Kolter Group has invested in real estate projects totaling over $15 billion in value. The Kolter Group has borrowed hundreds of millions of dollars over its 20+ year history and has never defaulted on a loan. 2 To date, all EB-5 investors in EB-5 projects offered by Kolter and EB5 Affiliate Network Affiliate have received I-526 approval from the United States Citizenship and Immigration Service (UCSIS). © EB5 Affiliate Network, LLC 2019. All Rights Reserved.